Cortana will not only be available on your computer, but she has gotten a whole lot better than on your phone. The software has undergone a major upgrade and is now specifically tailored for a full PC experience. The assistant is built straight into the Shell and resides constantly in the new search bar, in the remodeled task bar. But it does not only act like a simple voice search service. Use cases are incredibly varied and include easy and seamless access to files, settings, web and local search results and basically any other core function of Windows 10. Microsoft says Cortana is now more personal than ever with the soft female voice now cracking jokes, and understanding 7 new languages – it even does impersonations. Voice interaction and trigger words are very natural as well. You can simply ask Cortana to play some music or be quiet, which is definitely a step toward elevating it the status of an almost human-like assistant, rather than simply a clever voice operated machine. The increased personality factor comes from the fact that Cortana is now aware of the user it is aiding. Microsoft demoed some of these implications by asking for personal advice and suggestions and Cortana was more than happy to oblige. Cortana has also learned a trick or two from Google Now and is now really contextually aware, It will provide the right suggestions and notifications, just when you need them. Voice recognition has also taken a huge step forward. Voice typing was showcased as pretty coherent and almost usable on a daily base. Cortana will also be baked straight into the new web browser, codenamed “Spartan” for an even more intuitive and content-aware experience with link suggestion, info boxes and a lot more. 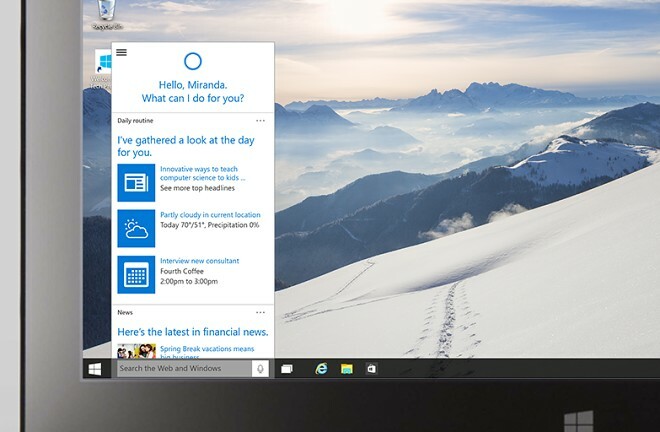 We are more than happy to see Cortana in the new Windows 10 and with the new added functionality it seems that Microsoft is really making an effort to bring forward a tailored experience for better productivity.